This is a great vacation place to feel good and enjoy the sand, water, and sun. There are some good restaurants to eat and plenty of nearby hotels. So enjoy the outstanding local wine and you can find an art gallery to visit here too. Purchase this print on 11x17 inch (28x43 cm) heavy duty premium paper. The image is about 10x14 inches (27x36 cm). The watermark does not appear on the finished print shipped to your home. Click here for more purchase information of my artwork. located near Santa Cruz, California on the coast of Monterey Bay and is known as the oldest beach resort on the West Coast. This festival is a nice event and the local chamber of commerce considers fun for the family. The admission is free and the hours are 10 AM to 6 PM. There is a lot to do at this festival. Wine tasting is available from a variety of Santa Cruz Mountain wineries. To make the wine even more enjoyable there is delicious gourmet food from local restaurants and caterers. Art and artists are on hand to discuss their work. The setting is just steps from the beach and I consider September a beautiful time of year to visit the ocean in Capitola. There are hotels and motels in Capitola and along the beach communities of Santa Cruz County such as Aptos, Soquel and Santa Cruz. They may sell out so you could consider Monterey California because it also has a lot of hotel rooms located about 40 miles away and can be reached in about an hour by car. Free parking is available near the Capitola Mall. There is a free shuttle service into Capitola Village. Take the Bay Avenue exit off Hwy. 1, head 1 block west and turn left at the Crossroads Center. Park for free behind the shopping center and catch a ride on the shuttle into Capitola Village at the beach. 10AM - 8PM weekends only. For more information contact the Capitola-Soquel Chamber of Commerce. (831) 475-6522. My artwork of the group of beachfront houses near the central district is shown above and now available on premium paper. These houses sometimes called the "Painted Ladies" because of their colorful display. Capitola is a fun place. I was drawn to the area because it is a popular tourist town with trendy shops and restaurants, a fishing wharf and a large, sandy beach. Don’t forget to visit the Capitola Art and Wine Festival. 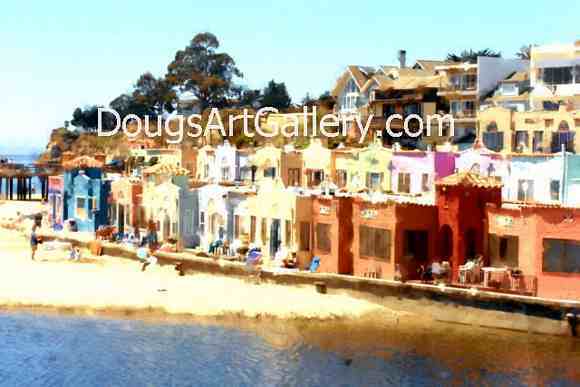 Click here to leave Capitola Art and Wine Festival for more links to artists and their online art galleries, art prints and art posters. Browse the links found at the bottom of Home Page. Do you like this artwork on this page?